The body is a complex system. In order to help everything work like it should, it’s important to give your body the proper fuel, in the form of specific nutrients. But, the nutrients you need will vary depending on the activity and how your body is working. The right nutrients can help fuel the activity itself, but also determine how your body recovers after a workout. Keep these nutrient guidelines in mind as you prepare to get out and get moving around Vail. Grabbing a snack before your Pilates class can help give you an extra boost, and can aid in weight loss. If the idea of snacking right before working out has you feeling a bit green, it may be the snacks you choose. Options like watermelon or an energizing smoothie (made of fruits, vegetables, nut butter, and coconut water) offer energizing nutrients with an added helper: hydration. Fruits, veggies, and nut butter help fill you up without weighing you down; nut butter gives you a boost of protein to fuel your workout; and coconut water offers delicious hydration. There are myriad trails around Vail, so what are you waiting for? Get out there! However, planning for hiking and backpacking comes with a whole different set of nutritional needs. You’ll be working and burning energy consistently, so you’ll need to provide your body consistent ways to replenish. As always here in the mountains, hydration is key. You’ll also want to have easy-to-eat nibbles to nosh on throughout the day. Options like dried fruits provide a burst of nutritious sugar, while granola gives the body extended-release energy of carbohydrates. Nuts and jerky provide protein to power your body as you work your way up the mountainside. Up here at elevation, even road biking can be a bit like mountain biking; both of these activities get the body working hard. 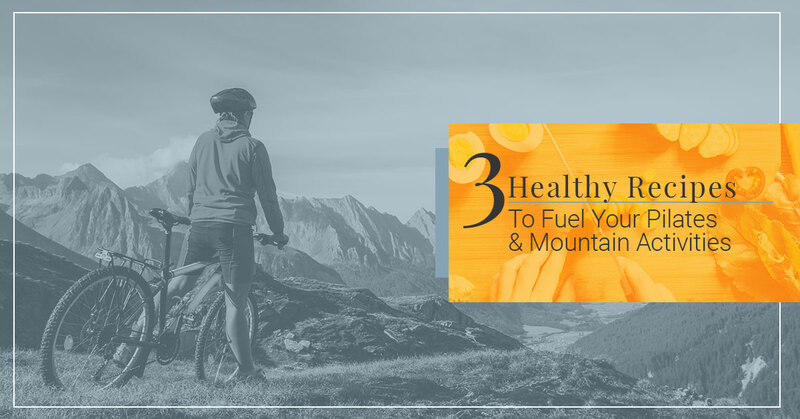 Since biking around Vail uses up a lot of energy, you’ll need to make sure you fuel up appropriately before you head out. Healthy carbohydrates the night before and morning-of offer an energy source your body can use throughout the day. This includes options like grains, but also vegetables, which also have fiber to help keep you feeling full longer. Given how much energy your body will be burning, you’ll also want to make sure you’re including healthy fats like avocado, nuts, and coconut oil. Of course, protein is also key. During and after your workout, give your body sources of lean protein like jerky and nuts (during) and beef, chicken, fish, and protein-rich yogurt (after). No matter how to choose to get active, the foods you choose to fuel your body can have a big impact. For more information on fueling your workouts well, the experienced team at Synergy Center for Wellness can help. Give us a call or come by our Vail Pilates studio and wellness center for everything from building up strength after a surgery to preparing for childbirth with prenatal Pilates — and check out the healthy recipes below to fuel your workouts well. Place almonds in food processor (or blender) and pulse until a fine powder forms. Add dates and pulse to combine until a thick batter forms. You may need to scrape down the bowl with a spatula as you go. Add remaining ingredients (except water), pulse to combine, adding water if the mixture is dry. Place mixture into a mixing bowl to finish combining with your hands. Form mixture into 12 golf ball size balls or press into a greased 8×8 baking pan. Refrigerate for 1 hour. If using pan, cut into 12 squares. Enjoy! Place all dry ingredients in a bowl or a glass jar and mix together. Add almond milk and stir until combined. Top with blueberries. Cover and refrigerate overnight or for at least 4 hours. In the morning, add the Tbsp peanut butter. Option to eat cold or heat up in microwave for 1 minute. Enjoy an easy, healthy, protein-packed breakfast! Rinse and pat dry cauliflower. Chop into florets and grate in a food processor (or use a blender, go in batches) until a rice consistency forms. Heat oil in large skillet over medium-high heat. Saute green onions for 2-3 minutes. Add garlic and saute until fragrant. Add cauliflower and saute for 5-6 minutes, stirring occasionally. (Add 1 Tbsp of water if too dry.) Transfer to a large bowl before cauliflower gets mushy. Toss with sea salt & pepper to taste. Serve.